Miguel Cortina Ponton is a Visiting Instructor of Mechanical Engineering in the St. Mary’s University. He joined St. Mary’s in August 2017 as an Adjunct Professor. Cortina received his B.S. in Mechanical Engineering from the National University of Colombia at Medellin in 2005. He obtained his M.S. in Mechanical Engineering from the University of Texas at San Antonio (UTSA) in 2012. He is working on his Ph.D. in Mechanical Engineering at UTSA. 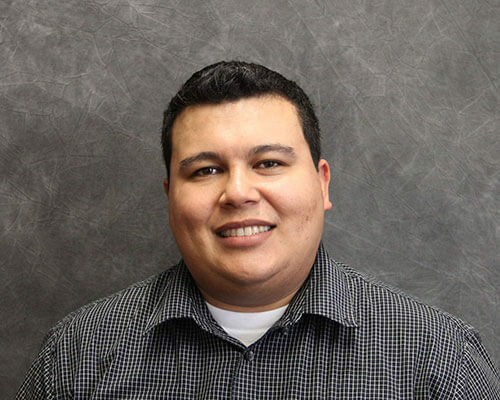 Prior to joining St. Mary’s, Cortina worked as a project engineer for Indisa-Hatch in Colombia from 2008 to 2010, research assistant for the Reliability and Visualization Laboratory at UTSA from 2010 to 2012, and research assistant for the Multiphase Flow Laboratory at UTSA from 2012 to 2016. He also was a lecturer for the Mechanical Engineering department at UTSA from 2016 to 2018. Cortina’s main research area includes computational fluid dynamics for multiphase flow, specifically the application of Lagrangian methods such as smoothed particle hydrodynamics for the study of heat and mass transfer in particulate flow. He is also interested in probabilistic analysis and reliability applied to engineering problem such as the application of sensitivities analysis method to fracture mechanics problems.